Grandparents and Children: Review of "Building Character from the Start: 201 Activities to foster creativity, literacy, and play in K-3"
"Building Character from the Start: 201 Activities to foster creativity, literacy, and play in K-3" has so many games and lessons that I can use with any of the kiddos. What an asset for home daycare providers as well as home-school moms! There are many tools to help foster creativity, literacy and play. We played Animal Charades and did Workout Rolls. It was fun to hear the answers that popped out of the kiddos mouths when they were guessing what animals we pretended to be. I would never have thought aardvark. Oh, I could not do many of the workout rolls with my bum knee. But the kiddos showed me how well they could bend, twist, roll and shout too! There is also a CD-rom that is both Windows and Apple capable. Here's a fun icebreaker game to play with a stack of pennies. My mother-in-law just shared it with me, and I thought you would like it! 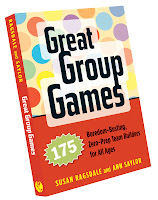 Great Group Games - a new E-Book! 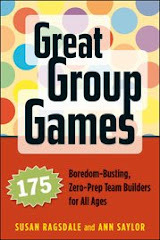 Great Group Games is now available as an e-book - so cool! So now you can download your favorite game on your smart phone and carry it to the ball field, rec center, office, classroom, camp, or wherever else you might want to play with purpose! How do you present complicated lessons about character to a kindergartener? How do you get a group of 8-year olds to think about purpose or integrity? And while they’re busy having fun, you ask the questions that help them think and shape positive values. 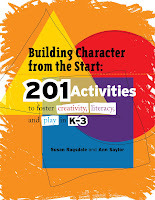 In Building Character from the Start: 201 Activities to Foster Creativity, Literacy, and Play in K-3, you will find a plethora of activities to engage children in learning, get them moving, and prompt them to think about character. The children will be having so much fun looking for hidden treasures or trying to balance on one foot that they won’t realize they’re also learning conflict resolution, responsibility, and other valuable life skills. This book is ideal for anyone who works with young children, including teachers, parents, day-care providers, and after-school teachers. It includes a CD-ROM with printable activities. Available for $29.95 at your favorite bookstore or at Search Institute Press. I found this game on the education.com blog this morning. It looks like a fun game to play with little ones. Just like it sounds, it's a combination of Itsy Bitsy Spider and Mother May I. Click here to read more about Itsy Bitsy May I.
Mike Calhoun at education.com just posted some clever games to promote academic learning. "Tell all the players to study some science related material. Next, have everyone stand up and form a circle, facing in, looking at each other. Toss a ball or some other round object to one player and have him or her tell what they thought was the most important concept they just learned. That person then tosses the ball to someone and that person explains what they though was the most important concept. Continue the exercise until everyone has caught the ball at least once and explained an important concept." Check all six ideas out at 6 Ways to Spice Up Your Teen's Studies! Book Deals Today at Borders Bookstore! If you've been waiting for a sale to buy Great Group Games or Ready to Go Service Projects, today is your day! Print a Borders coupon for 40% off any paperback through Sunday, August 16th (off list price).